The Japan Air Self-Defense Force (JASDF) confirmed on Wednesday morning local time that a fifth-generation Lockheed Martin Lightning II F-35A fighter jet that went missing during a training exercise off northern Japan has crashed. A section of the missing F-35A’s tail was reportedly found and retrieved from the sea late Tuesday. The pilot, a male in his 40s with more than 3,200 hours of flying experience, which includes 60 hours flying the F-35A, remains missing. Search efforts are currently underway and involve a U.S. Navy Boeing P-8A Poseidon maritime patrol aircraft, the Arleigh Burke-class guided missile destroyer USS Stethem as well as Japanese U-125A jets, UH-60J Black Hawk helicopters, and a P-3C maritime surveillance plane, next to other assets. Three Japan Coast Guard vessels have also joined the search efforts, according to the JASDF. In a statement, the JASDF identified the crashed F-35A as serial-number 79-8705. 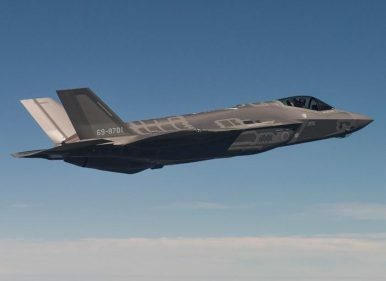 Defense News reports that the aircraft was the first to be assembled at the Mitsubishi Heavy Industries (MHI) F-35 Final Assembly and Check Out (FACO) facility in Nagoya. As I reported previously, the first locally assembled F-35A was rolled out in June 2017. The JASDF’s first batch of four F-35As were built in the United States. The crashed stealth fighter was one of four F-35As that took off from Misawa Air Base for an air combat training mission at 6:59 p.m., Japan time, on April 9. One F-35A disappeared from radar tracking systems at 7:27 p.m. April 9 about 135 km (84 miles) east of Misawa Air Base, in the northern part of Japan’s main island of Honshu. The JASDF entire fleet of F-35As will remain grounded for the time being. The April 9 incident marks the first crash of a F-35A. An F-35B crashed near Marine Corps Air Station Beaufort in South Carolina in the United States in September 2018. The accident led to a temporary grounding of the aircraft. According to an investigation, the likely cause of the F-35B crash was a faulty fuel tube.